As a lot of you who have read stuff I have written about before will know that I am mainly interested in desktop development, WPF in fact. You may have also noticed that my blog has been a bit quite lately, which is due to the fact I am working on a pretty large open source project using ASP MVC 3, which is eating all my spare time, as such I have not been writing as many articles as I had been. The open source project is coming along nicely, and I am getting closer to completing it. During the course of working on this open source project I have been trying to write ASP MVC 3 code using best practices and have an excellent ASP MVC clued up colleague who answers my dumb questions. Now the other day I asked him why the standard HtmlHelper.DropDown and HtmlHelper.DropDownFor extension methods require you to use some really filthy objects such as SelectListItem. Now I donâ€™t know who will be reading this post, but I come from WPF land which kind of paved the way for the ModelViewViewModel pattern, which ASP MVC seems to borrow for its Model approach these days. I think it is fair to say that most ASP MVC devs will be treating their Models and View specific Models AKA ViewModels. 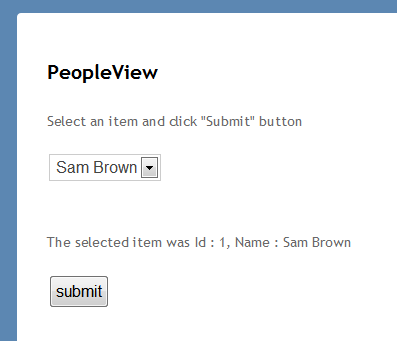 So we have this Model for the View (AKA ViewModel), which gets bound to a Razor view using ASP MVCs Model Binding (assuming you are using Razor view engine and not just some REST/JSON/JQuery Ajax approach where you miss the view engine out altogether, thatâ€™s cool stuff too, but not the subject of this post). Ok so far, but now I want to create a DropDownList (HTML Select tag) using one of the existing HtmlHelper.DropDownList and HtmlHelper.DropDownListFor extension methods. This is where the fun starts, I now have to pollute my nice clean view specific model (ViewModel) with crap which in my opinion, is a view concern. Ok you could argue that the Model is view specific so what is the harm in having a IEnumerable<SelectList> property in there. Well it just doesnâ€™t sound right to me, and lets push the boat out a bit more, and imagine I want to test my Models. They now have UI Specific stuff in them, so my tests now have to know about UI specific stuff. Which again sounds wrong to me. Ok I donâ€™t know what your tests look like, but mine have separate test suites for models, than I do for my controller tests. In my test suite where I am testing my controllers I half expect a bit of stuff to do with view specifics such as ViewData, Session, ActionResults etc etc, but in my models I just donâ€™t want any UI stuff in there. Well the answer is surprisingly simple, we just create our own HtmlHelper which does a better job and allows us to maintain a nice clean model and allows better separation of concerns. Ok lets have a look at the finished code then shall we. Oh one thing before we start, I am using a standard ASP MVC 3 project that you get when you start a new ASP MVC Razor based project from within Visual Studio 2010, so I hope you are familiar with that and the objects it creates. This is where the real work is done, and I came up with 2 approaches which are both shown below. The attached source code has them both in but only one is active, the other is commented out. I will leave it to the user to decide which they prefer. However one thing both approaches have in common is that they use Expression<Func<T,Object>> to obtain all the information required to create the html select using the models properties. This can be seen below where I show a demo of it within the demo view. Is all done using Expression<Func<T,Object>> which is nice a type safe.